TWO days till we close on our new home and we are purely excited!! We got a lot done this past weekend but have had some very busy weeks and have definitely put some focus on staying cool, calm, and collected. When I changed the name of this blog to Create/Enjoy I knew I wanted to talk about more than sewing and decorating. I still love those things but I also really care about living an intentional, happy, healthy, grateful, low-stress lifestyle. (I do have several posts about stress and overcoming it.) In this exciting but crazy time of our lives, it's even more important to me to take steps to keep the stress down. This post was sponsored by Rescue Remedy (the timing was perfect since we have a lot on our plates right now!). 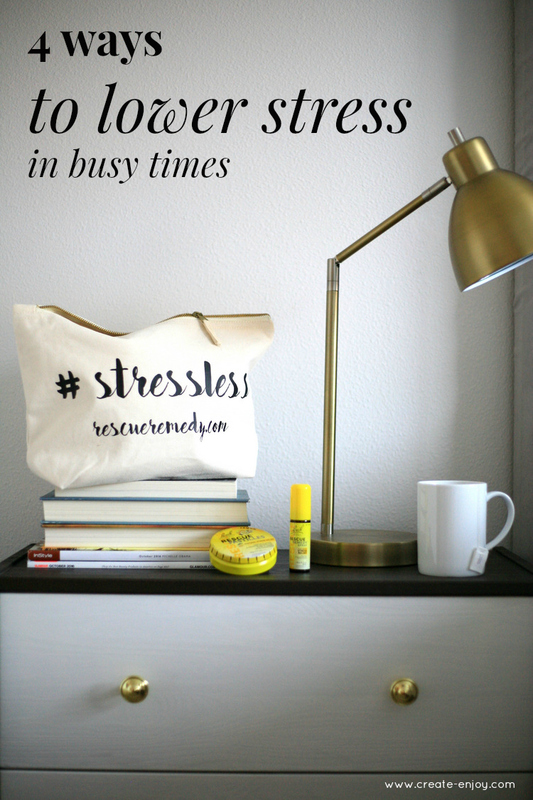 I've found four key tools for staying sane while shuffling the home purchase, working, blogging, working out, cooking for our family, and more! These tips will be helpful even if you're not buying a house! 1. Keep the same routine. For me, this has meant I've continued my 3x/week at-home workouts and making time to cook. And going to bed on time. Keeping the physical stressors and surprises down makes it much easier to shoulder mental stressors. I feel so much better when I stick to my routine and move my body, eat real food, and have energy! It's worth the lost time that could be spent packing or working. Except in extreme examples, I prioritize sleep and other habits and it really helps. 2. Give yourself healthy treats. As Gretchen Rubin explains in Better than Before, treats energize us and improve mood and self control, but indulgent ones can have negative consequences. Healthy treats are treats that actually make us feel good in the long-term, not just in the moment. Healthy treats for me are baths when I have time, comforting tea (I love Calming and Kava Stress Relief from Yogi Tea), and reading one of the many magazines in the pile I'm usually behind on. 3. Make lists. And take list-making to the next level! As you can probably imagine we have a LOT to do in the next few days... the paper list on the counter was just not cutting it. We have tried to put EVERYTHING on a list and check or cross off as we go. We started a shared Google Sheets to-do list with tabs for "before moving," "ASAP [once in house]," and "later [house to-dos]." That way we can put all the things either of us could do in one place--and we can both track which utilities we've transfered over and when we've reserved the rental truck. (I know there are a million apps for to-do lists, like Wunderlist and Todoist, but I like to keep things simple even with technology!) And, it feels so good to cross something off! 4. Get (and appreciate) help. I am so grateful to husband when he's around to unload the dishwasher, carry things to my car, clean up a little... but I've had to remember to ask! Asking for help is so important--you really can't do everything yourself, and everyone needs a little help sometimes. Other "helpers" include to-do lists, phone alarms (I set a timer while packing books the other day so I knew I would stop in time), and stress relief tools like massages or Rescue Remedy. You might think of a glass of wine every night as a helper in a stressful situation... but that may have some negative side effects that will hurt you in the long run! There are more gentle chemical methods like spritzing some Rescue Remedy spray when you drop a heavy box on your toe or are late running out the door! My mom is a big fan of Rescue Remedy and used to offer it to me when I got hurt or upset. I sort of forgot about it now that I'm on my own, but I have my own stressful situations now and sometimes feel anxious and a tightness in my chest. I usually do pretty well with practicing relaxing breathing and slooooowing down, but I'm glad to also have the stress relief spray and pastilles for particularly challenging times! Rescue Remedy actually has a line for pets and kids as well so you can find just the right product for whoever's under stress. You can buy it at a number of drug stores and natural grocery stores--try typing your zip code into this store locator if you're not sure what's nearest to you. There you have it! Four things that are keeping me calm and happy as we make this huge, messy, physically and mentally challenging change! Here's to staying positive and saying "no" to the stress! What are your favorite stress relief methods? You can shop the products in the post here or use the store locator for stores carrying the Rescue Remedy line!